There are certain immutable rules about BMW bikes. They are all lumbering, expensive tourers, made with Teutonic precision only in the heartland of Germany. In Britain, they belong exclusively to bearded Yorkshiremen in smelly Barbour jackets who smoke pipes, and moan constantly about 't price of a pint. Above all, BMWs have shaft drive, always have had, always will have. It's probably written in the Bible somewhere. Wrong on all counts actually, as BMW's best selling bike is actually a mid-sized, 650cc single cylinder trail bike, and it has a chain! Three years ago BMW broke all its own rules, and launched the F650 "Funduro", a bike built under licence in Italy and styled to cash in on the huge demand in Europe for semi off-road bikes. It was a huge gamble, but BMW knew they had to diversify, and I doubt if even they predicted just what a success this bike would be. Whether by luck or judgement the F650 was launched with perfect timing to a style conscious younger audience, just as motorcycling was beginning to gain ground again as a leisure activity and sales were on the up. The trail bike look has been all the rage for some years abroad, and the original Funduro was right on the money. An instant bullseye for Herr Bimmer. The trouble is that the "big trailie" style of bike never really caught on in Britain. 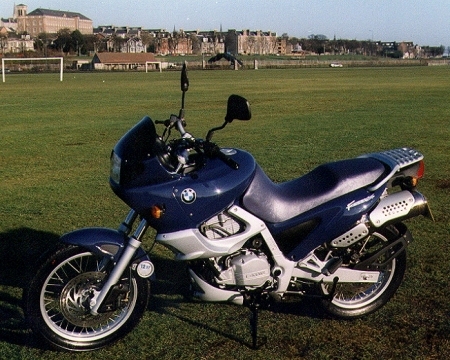 The original 650 was light and relatively easy to ride, it was also very tall, and off-putting for smaller riders, in particular the growing band of female riders who BMW are clearly keen to attract. So enter the second coming of BMW's Italian Job, the F650 ST "Strada". This takes the winning formula, but makes it more suitable for road use, no surprises that Strada is the Italian word for road. They have lowered the seat height, given it a smaller front wheel, narrower handlebars, more suitable road tyres, and a cosmetic work over. Launched in the UK less than 2 weeks ago with typical BMW razzmatazz, the bike you see here is one of the very first to hit the roads of Scotland, fresh out of the crate courtesy of John Clark BMW in Dundee. If you are used to the heavy duty sophistication of a traditional BMW, this little bike takes a bit of getting used to, so book a good long test ride. A single pot 650cc engine, no matter how sophisticated, is very different to the turbine like smoothness of todays multi cylindered engines. That is not to say it is rough, far from it, as it has an eager revvy nature, and a charisma all of it's own. Not for nothing were single cylinder engines known as thumpers, and a single 650cc piston makes a sizeable thump. Let it drop too far down the rev range and it will stutter and protest, but keep it spinning and it is capable of a deceptive turn of speed. The newly lowered ride height is a boon if you are short of leg, and the bike is a delight around town and through traffic. The smaller front wheel and new tyres make it highly agile, though to be fair, a frosty January day is not the time to explore the outer reaches of the handling. What is a surprise though is how effective the bodywork is. There is hardly any screen to speak of, yet at motorway cruising speeds you are remarkably well protected from the wind blast. Clearly someone has been doing some careful homework in the wind tunnel, and it shows. But the best bit is the price. At 5,650 on the road it is not cheap compared to the latest budget competitors from the far east, but in BMW terms it is the cheapest new vehicle in their price list, with the possible exception of their new 2,500 mountain bike. Owning a two wheeled BMW is more than just that desirable blue and white roundel. For a start they are sold from civilised outlets, not a description that all bike shops yet merit, more's the pity. There is huge range of practical and genuinely useful accessories, from luggage systems and heated hand grips, to clothing and helmets. Better yet is that you can expect the same standard of customer care as the chap buying a 740i. I can predict one downside though. I guarantee that everywhere you park one of these, there will be a pipe-smoking Cyril from Cleethorpes waiting for when you get back, darkly muttering something into his beard about chains! At least you will be able to make a stylish getaway.